What a treat to live in the host city for one of the best writing conferences around, Romance Writers of America! Romance writers are both incredibly professional and incredibly kind. 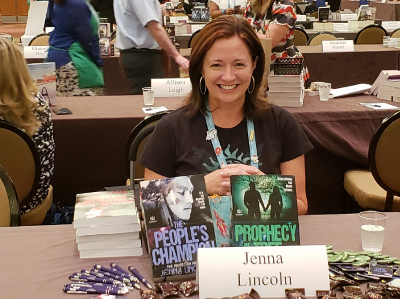 Nearly every session of RWA is taught by a New York Times bestselling author, so not only do you have tremendous learning opportunities, you can get your fangirl on as well. My favorite session was taught by Jennifer Lynn Barnes on Writing from Your ID. It was about finding all the things that please you and making sure you give yourself permission to include them in your writing. For example, Jennifer Lynn Barnes likes ice cream and rooftops. Turns out in her last six books people get milkshakes or ice cream and several critical conversations happen on rooftops. For me, one of my favorite things to find/write in a book is girls with weapons. No surprise there. I also like scenes in kitchens, eating or cooking, and I like competitions. The next time you sit down to write, maybe start with a list of things that please you when you allow yourself to be free of judgement. Or you could start with ice cream, always a great idea in the summer. Your browser does not support this Twitter feed.